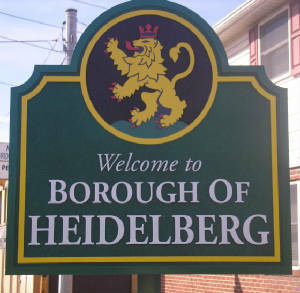 The Borough of Heidelberg sits six miles southwest of Pittsburgh in Allegheny County, Pennsylvania. The Borough is readily accessible, having its own exits off the Parkway West (I-376) and U.S. Interstate 79 (I-79). The "main drag" of town is State Route 50 (Rt. 50), a major artery in the southern suburbs of Pittsburgh, which essentially bisects the town in a east/west direction. As Route 50 passes through the Borough, it is lined with many shops, businesses and convenience stores. Heidelberg has a gentle, rolling topography with quiet, tree lined streets, well-maintained homes and lots of friendly people. The rectangular and regular street pattern of the Borough and its quiet nature have led the Western Pennsylvania School for the Blind to routinely use the town as a safe and consistent training ground for its students to learn to navigate as pedestrians. The Borough has a population of approximately 1,250 people, is about a third square mile in size, and has a long, rich and interesting history.